HOUSTON  (Oct. 21, 2008)  Property sales across the greater Houston area declined further in September, due largely to the widespread devastation caused by Hurricane Ike and the resulting interruption to business that included many real estate transactions. According to statistics released by the Houston Association of REALTORS® (HAR), sales of single-family homes dropped 30.2 percent for the month of September when compared to September 2007, marking the thirteenth consecutive monthly decline. However, home values again remained the bright spot in the HAR monthly report. The average price of a single-family home rose by 4.4 percent in September to $211,660, the highest level ever for a September in Houston. The median price of a single-family home rose 5.0 percent last month to $157,500, also an all-time September high. The median price represents the figure at which half of the homes sold for more and half sold for less. Sales of all property types for September 2008 totaled 4,189, reflecting a 29.5 percent drop compared to September 2007. Total dollar volume for properties sold during the month was $857 million versus $1.2 billion one year earlier, a 28.6 percent decline. Despite Ikes rampage, the month of September brought Houstons overall housing market mixed results when considering all listing categories. Total property sales and total dollar volume fell, however average and median single-family home sales prices continued their steady increase on a year-over-year basis. The number of available properties, or active listings, at the end of September fell 6.6 percent from September 2007 to 50,155. Thats 2,676 fewer active listings than August 2008, and is seen as an indication that inventory levels are balanced and that home prices should remain strong. Month-end pending sales  those listings expected to close within the next 30 days  totaled 2,583, which was 37.9 percent lower than last year and strongly suggests the likelihood of another sales decline next month. The months inventory of single-family homes for September came in at 6.4 months, the lowest level since April of this year. That compares to the September 2007 single-family homes inventory of 6.3 months. At $211,660, the average sales price for single-family homes reached the highest level recorded for a September in Houston, up 4.4 percent from the same period last year when it was $202,728. The overall median price of single-family homes in September was $157,500, also an all-time high for the month of September. That compares to the national single-family median price of $210,900 reported by the National Association of REALTORS®. These data continue to demonstrate the higher value and lower cost of living that prevail in the Houston market. Additionally, total September sales of single-family homes in Houston came in at 3,510, down 30.2 percent from September 2007the steepest decline ever. It was the thirteenth straight monthly drop. HAR also reports existing home statistics for the single-family home segment of the real estate market. In September 2008, existing single-family home sales totaled 2,975, a 27.6 percent decrease from September 2007. At $200,610, the average sales price for existing homes in the Houston area rose 6.4 percent compared to last year. The median sales price of $150,000 for the month was also up 6.4 percent from one year earlier. The number of townhouses and condominiums sold in September fell compared to one year earlier. In the greater Houston area, 379 units were sold last month versus 483 properties in September 2007, translating to a 21.5 percent decrease in year-over-year sales. Thats an improvement from 25.1 percent slide a month earlier. The average price of a townhouse/condominium increased to $162,401, up 0.4 percent from one year earlier and the highest figure for the month of September. 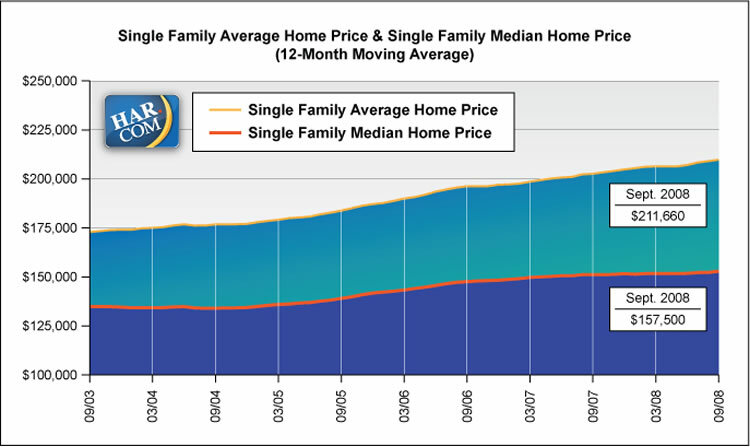 The median price rose 2.1 percent to $127,500 from September 2007 to 2008. That figure is also a high for the month of September. Demand for single-family and townhouse/condominium rentals increased in September as a result of Hurricane Ike, as consumers sought short-term accommodations while initiating home repairs. Contractors, insurance adjusters and other professionals from outside the Houston area who are involved in Ike-related recovery projects were also part of that demand. Single-family home rentals rose 13.5 percent in September compared to a year earlier, while year-over-year townhouse/condominium rentals were up 17.5 percent. Highest median townhouse/condominium sales price for a September ($127,500). The computerized Multiple Listing Service of the Houston Association of Realtors® includes residential properties and new homes listed by 26,000 Realtors throughout Harris, Fort Bend and Montgomery counties, as well as parts of Brazoria, Galveston, Waller and Wharton counties. Residential home sales statistics as well as listing information for more than 53,000 properties may be found on the Internet at https://www.har.com. Founded in 1918, the Houston Association of Realtors® (HAR) is a 27,000-member organization of real estate professionals engaged in every aspect of the industry, including residential and commercial sales and leasing, appraisal, property management and counseling. It is the largest individual membership trade association in Houston, as well as the second largest local association/board of Realtors® in the United States.